As the New Year Day festivities concluded on January 1, Puttaparthi saw an increasing habitation by the Sai Youth from the states of Maharashtra and Goa. 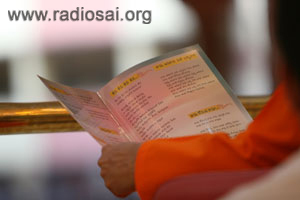 Donning their orange scarves, they filled up large areas in the Mandir on January 2nd, the day Swami had blessed them to put up their programmes in front of Him. 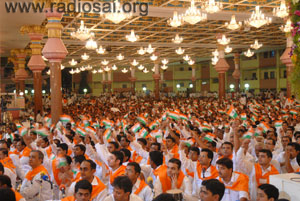 A huge curtain of the Tricolour (India’s national flag) hung from the ceiling to the floor acting as the giant background. It was at about 5:30 p.m. when Swami arrived for darshan. The most revered "Orange" wended its way through the orange throngs and the youth rejoiced at the opportunity of close darshan. He passed by the massive backdrops of the red fort and the curtain into the gents’ side. After completing the darshan rounds, Swami moved into the interview room. Twenty minutes later, He came out and asked for the programme to begin. A train of youth moved up to Swami with various offerings, and Swami patiently blessed each and every one of them. He accepted roses, glanced at cards, observed photos and permitted everyone to take padanamaskar. Then, Swami called the coordinator and told him to make the announcement and begin the programme soon. 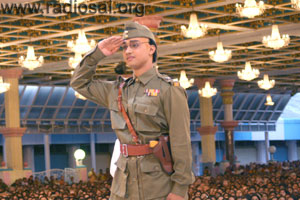 The introduction for the drama on Netaji Subash Chandra Bose was given, and then the performance began. It started with the lighting of the Akhanda Jyothi. 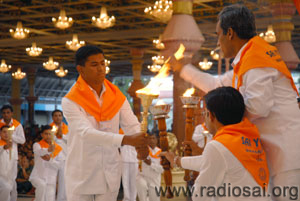 27 lamps of divine light, which were lit from a single flame from the Divine Precincts of Dharmakshetra, and which had traveled through 27 Districts of Maharashtra, were presented at a beautiful ceremony in front of Swami. The 27 Jyotis merged into one in the Divine presence, and that was used to light a candle, which Swami used to light the "Maha Jyothi" as they referred to it. After that ceremony, the drama began. Subash Chandra Bose also called Netaji was a colossus amongst the brave men of the world. He was born on January 23, 1897 in Cuttack as the ninth child among the fourteen that Janakinath Bose, an advocate, and Prabhavati Devi, a pious and God-fearing lady had. A brilliant student, he topped the matriculation examination of Calcutta province and passed his B.A. in Philosophy from the Presidency College in Calcutta. He was strongly influenced by Swami Vivekananda's teachings and was known for his patriotic zeal as a student. It was his parents’ insistence that kept him away from the freedom struggle but not for long, as the passion for true "freedom" had been deeply embedded in him. As he later wrote to his mother, he was not fighting only for independence from British, for, the nation still had to be administered after that; he also desired true freedom in its complete spiritual sense. The drama traced all the major milestones in his life and it was an inspiring enactment. Swami too watched the drama very keenly. As the drama concluded with the final song with Bose marching out with the INA - the Indian National Army, the Tricolour was waved in thousands by all the members of the audience from the organising states. 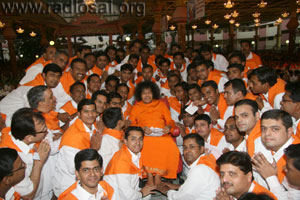 Swami consented and moved down the stage to grant the participants their cherished desire of a group photo with Him. As He did that, He also spoke to many boys and accepted letters. One particular boy almost broke down telling Swami that though he had been studying and trying very hard, he was not getting a call to do MBA in Bhagavan’s University. Swami took his application form and gave instructions that the call letter be sent to that boy! When we are with God, the solutions for problems crop up as fast, if not faster, than the rate at which the problems arise! Then, moving towards the front, Swami called out for the three different-aged ‘Boses’! He took a picture with the three and said, "This is young Bose. He is elder and that is the eldest one!" There were smiles all around. Prasadam was then distributed as the youth started bhajans. 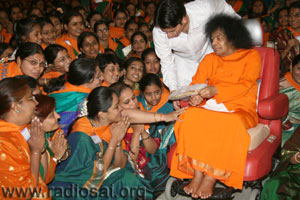 Later, on Swami's command, the bhajan singing was taken over by the current students of His University. 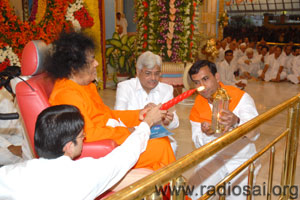 It was quite late in the evening by the time Swami received aarthi and retired to His residence. January 3 saw the second chapter of the triad of programmes that the youth from Maharashtra and Goa had come prepared with. On that day, it was to be a sitar and "zitar" concert by Niladri Kumar, son and disciple of sitar player Pandit Kartick Kumar who was in turn a disciple of Pandit Ravi Shankar. Considered a child prodigy, Niladri Kumar started learning sitar under his father at the age of four and gave his first public performance at the age of six. 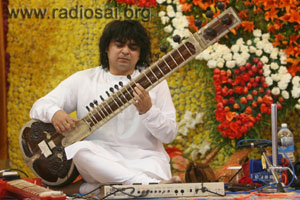 The "zitar", a creation of his, is an instrument that is a fusion of the sitar and the guitar. Along with his accompanying artistes, he sat ready from 3:30 p.m. awaiting Swami to arrive and bless him with the great privilege of playing in His presence. It was 5:15 p.m. when Swami arrived for darshan. He took the detour after the ladies side and went in straight to the interview room. A few minutes later, He came on stage and blessed the artistes of the day. 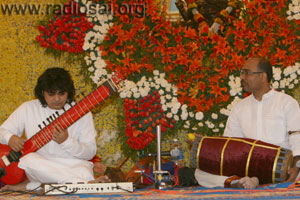 Bringing the Veda chanting to a halt, He permitted Niladri Kumar to begin his concert. Starting with paying homage to Swami he said that when he first came to Swami many years ago, his hand was on bandages. Swami had blessed him in the darshan lines and told him to play the next day. He did exactly that and from that day on, every note that has issued from him, has been due to the blessings of his guru and Swami! He began with the zitar first and played a piece that was clearly a fusion of the east and west. The "twain had indeed met", with due regards and respects to Rudyard Kipling. There was accompaniment on the tabla, mridangam, keyboard and the jazz drum kit. After a sprightly start with the fusion piece, the concert meandered along the more traditional lines with the classical sitar coming into play. The young sitar virtuoso amazed and thrilled all, especially those trained in music, with his superb rendition. There was a piece where He played in pitches unimaginable on the sitar, using the help of a wood piece as a prop. That excited the audience so much that they began to clap even before he had rendered what he had desired to. He, therefore, had to repeatedly appeal for calm so that the beauty of the entire effort could be appreciated. After his three pieces of rendering, the artiste concluded and Swami seemed very happy. He called him and what a response it was! He rushed straight to His feet and sought His blessings. Swami gifted safari pieces to all the artistes and materialized a gold ring for Niladri Kumar. 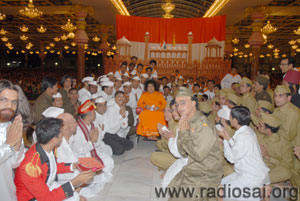 After giving padanamaskar to all, Swami asked them to sing something! The keyboard accompanist also was a good singer, and so all of them went back and began the bhajan, "Madhusudhana Hare Madhava". They built into the bhajan pieces in which the tablist, mridangam player and the drummer could display their respective expertise. A jugalbandi of sorts ensued and the entire piece lasted for about 10 minutes. As that concluded, Swami gifted them a satisfied smile and then received aarthi. The last day of the Maharashtra and Goa youth pilgrimage was on January 4 and planned for the day were two songs programmes, one each by the ladies and the gents. 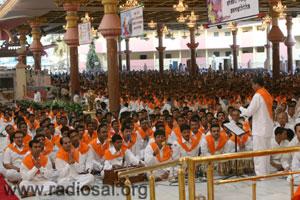 Swami came out for darshan at about 4:15 p.m. and after the rounds, arrived on stage. He sat listening to the chants for a while and then moved into the interview room. It was about 5:00 p.m. when He emerged again and asked the youth to begin their programme. He blessed both the ladies who went up to Him by sprinkling the holy grains on their heads. The ladies then started their rendering. It was a programme based on the great women of Bharat. There was a short narrative in English and Telugu. It must be recorded here that the speakers who spoke in Telugu did it "by heart" in every sense. Though ignorant of the language, their diction and delivery were perfect. There were narratives on the great women like the Rani Laxmibai, Draupadi, Urmila (the wife of Lakshmana) and the wife of Saint Tulsidas. A song specially composed on the woman concerned followed each narrative and there was also a mini-ballet depiction of a major incident in that woman's life. Swami seemed quite absorbed in the presentation, except once in a while He would keep looking at the gents' section and ask, "Why are you all not singing?" Soon enough, on the conclusion of the ladies programme, the gents came to Swami to seek blessings to begin their part of the presentation. They also got a book released, which Swami personally signed, with His own hand! The songs had all been pre-recorded and the youth sang over the CD track. Clearly, Swami was not too happy. He told the co-coordinator that everything has already been recorded. 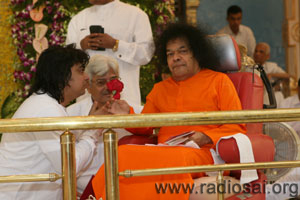 Swami seems to prefer performances to be "Live" for there is a joy when we do things directly for God in His presence. The end result may not be so fantastic, but God never sees the results - He is interested only in the efforts. 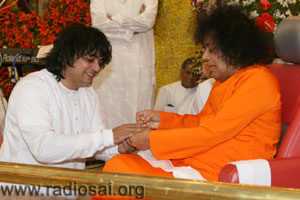 After two songs, Swami moved into the interview room and the songs too went on. They could not cease as the tracks played on. The songs were abhangs and some were those that Swami Himself had composed. 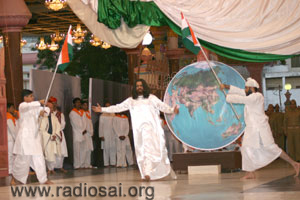 After the programme concluded, Swami arrived on stage again. He had an enigmatic smile on His face. He came down the stage and went first towards the womens' section and began to distribute sarees to them. Then, He waded right into their midst and posed with them for a group photo. They were a picture of high joy and deep gratitude as Swami sat smiling among them. Then He advised, "Do more work. Do not get into politics. There is so much politics among ladies!" All this while, the gents side was a picture of doubt - would Swami come to them? Swami smiled and moved towards the gents’ side. There was a loud cheer as Swami got safari cloth pieces for them too. Later, He posed for pictures amidst them. He accepted letters from many of them and then moved to the front, where He sat watching the distribution in progress. In the meanwhile, noticing the video cameraman shooting Him He said, "Shoot them! Not me." The cameraman went up to Him and said, "Swami it is you who lends value to all that we shoot." Swami seemed to have no reply for that and rightly so, for of what value is anything that is devoid of Him? Swami then moved up the stage and asked the ladies to lead the bhajans for the evening. Two bhajans later, Swami received aarthi and retired for the day.